Southall’s Best Life in the World expedition saw him drive from Singapore to London with his wife Sophee through countries such as Pakistan. One of the many joys of travel is serendipity—the chance discovery of a favourite restaurant; a random encounter that leads to a life-long friendship; or a perfect, fleeting moment in which the natural world reveals its hidden wonders. While travelling for pleasure tends to be a luxury for most of us—with annual holidays, gap years or perhaps travel while on sabbatical being the main chances to get away—some lucky individuals have managed to make a living doing it. Among them is Ben Southall, an adventurer, author and digital journalist from Alresford, Hampshire. Since 2000, he has engaged in a series of expeditions and adventures, most notably in 2009, when he secured the “Best Job in the World”. These experiences have seen him work with a number of high-profile brands and give talks around the world—including in Japan—on his work and travels. Tourism Queensland hand Southall the keys to his luxury villa. Southall has also been fortunate in his timing. In 2008, he embarked on a solo trip around Africa, which he dubbed Afritrex. This happened to coincide with the growing maturity of social media, and as he began to communicate with friends and family using these media tools while on the road, he found himself inadvertently becoming versed in their intricacies just as their real power was beginning to be felt. “It wasn’t so much about being a portal for other people”, said Southall. “I knew that I needed some way of … keeping in touch with [my parents]”. This took the form of a regular blog, as well as photo and video uploads to Flickr and YouTube. “I liked the idea of updating a website as much as possible, because I knew that mum and dad would be keen; I knew that friends would be keen to see what was going on; and it was also acting as a good point of inspiration for anybody else who might be planning a trip. But that was … secondary to the whole friends and family thing”. When Southall was preparing for Afritrex, much of the social media we now take for granted was in a very different state—Facebook only opened to registration by members of the general public in late 2006, Twitter had only been launched a few months prior, and Instagram didn’t even exist. As a result, while trying to find up-to-date, on-the-ground information about his destinations, Southall found himself engaging in the more social, interactive side of the Internet through message boards and blogs. And one of those sites in particular caught his attention. “It was a young couple that were basically doing what I wanted to do, and that was drive down the west coast of Africa in a Land Rover. So it was a really good reference point for me to follow their website, see that they were putting a diary or a blog post up once a week and a good few photos”, he said. While Southall was up and down the coasts of Africa, completing five marathons and climbing the five highest mountains on the continent, the marketing power of social media was becoming increasingly apparent. And Tourism Queensland, the organisation responsible for promoting the Australian state, was planning something. Southall has dived the length of the Great Barrier Reef. On returning to the UK in December 2008, Southall was expecting to settle back into a familiar routine. But the following month he found himself receiving emails, texts and newspaper clippings from friends and families about an opportunity in Australia. That turned out to be a job advert for the self-proclaimed “Best Job in the World”—an advertising campaign run by Tourism Queensland masquerading as a job advert for a “caretaker” of the islands of the Great Barrier Reef. And Southall was perfectly suited for it. “It was only when I got to the end of the trip that I realised the spike in audience I’d received over the year, and then the credibility of using that digital resume to apply for the Best Job in the World. “I’d obviously been doing exactly what they needed, so my resume had already been built by my year of hard work in Africa for friends and family”. Some 35,000 applications later, the pool of contenders was gradually narrowed down, and Southall was crowned the winner. And, although the best job wasn’t quite as paradisical as the advert suggested—one of the main perks was the chance to stay in a multimillion-dollar villa, yet due to work Southall spent only a few nights in it—he was nonetheless afforded the opportunity to pursue his wanderlust dreams and expand his digital media resume even further. But it hasn’t just been fun and games since Southall landed his job as caretaker of the Great Barrier Reef. In addition to various expeditions—which include a 55,000km drive from Singapore to London in his trusty off-road, all-terrain Land Rover Defender named Colonel Mustard—and breaking Guinness World Records, he has honed his social media skills, written a book—The Best Job in the World: How to Make a Living From Following Your Dreams—and founded the video production firm Cinomad. 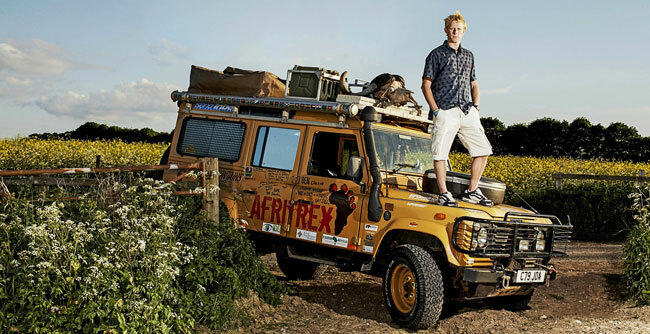 Southall drove around Africa in 2008 in his trusty Land Rover Defender named Colonel Mustard. Along the way, Southall has learnt that authenticity is key. “[Having a lot of followers] is a great asset to have”, he said, “but I think it is more important if you can keep your credibility in the brand that you are, and you keep delivering on the sort of qualities that you exude. “I’ve got people that I know I had following me when I was doing Afritrex that are still following now, and those are still probably some of the most engaging conversations I have. “I just love the great outdoors. I love the world. I find it is my best classroom and, therefore, if I keep learning in that world and I keep doing those same sort of things, that audience comes along for the ride with you”, he added. “That’s almost more valuable from a marketing perspective than just sheer numbers of people”. While Southall’s initial contact with social media was largely driven by his own sense of adventure, working with brands and tourism organisations has been one of his main focuses in recent years. And it is a markedly different experience from that in the days of Afritrex. “It was very easy in those days to get sponsorship. But sponsorship was, literally, ‘We’ll give you one of our products, because we’d like to see you using it. Just take a photo or two that you can send us, and we’d like to test our product in the field’”, explained Southall. “I was a bit pioneering in those days to be able to go and do those sorts of things, whereas now everybody is a videographer, everybody is a photographer, everybody’s got their social media channels, so companies are wanting a lot more bang for their buck on what they’re actually giving you”. When working with brands, good preparation, naturally, is essential to a successful campaign. That is not only in terms of logistics and deliverables—Southall and his wife and business partner Sophee often work in testing conditions outdoors and on the road—but also ensuring that the campaign is going to have the maximum reach. In 2013, Southall and two others set a world record for the fastest ascent of the tallest mountain in each state in Australia. “Building people up to the start of a project is very important”, said Southall. “Working with the partners to utilise their channels is the other most important thing. “That’s where you start to build people’s desire and jealousy in a way that they want to go and do that sort of thing themselves”. All of this is now informing Southall’s latest venture—Best Life Adventures. 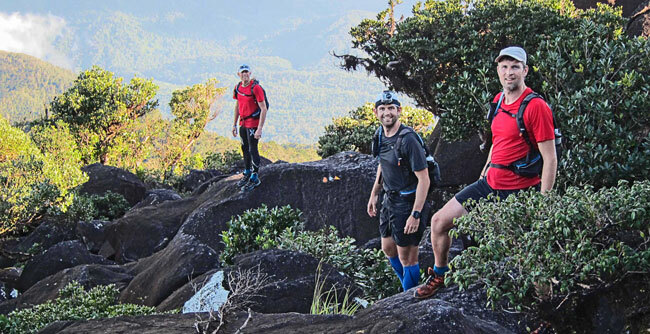 This will see Ben and Sophee lead other people on expeditions of the sort that helped them make their name and, they hope, break a few world records along the way. When it comes to promotion, their skills as videographers and photographers are going to be key. “The big bit now is turning it into a story that’s sellable and usable by all the other people that are involved in the journey as well”, said Southall. “[People on the trip] want bragging rights. At the end of the day, nobody does it just for the sake of themselves—they want to turn around to their colleagues, their peers or their family and use it on Facebook. “It’s a great sales tool for Best Life Adventures down the line”.